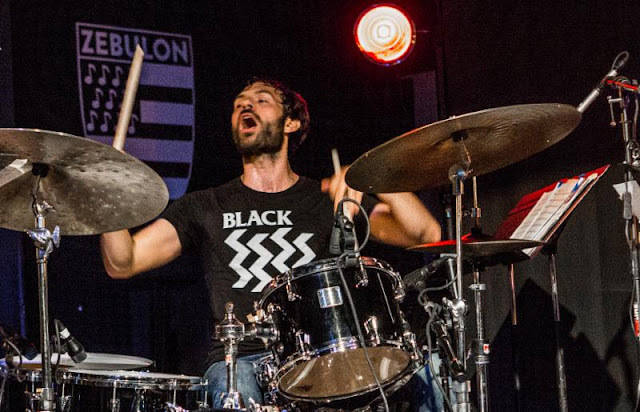 As Starebaby, the latest LP from New York City-based drummer DAN WEISS, nears early April release through acclaimed jazz label Pi Recordings, the first single has been issued. The album's fourth track, "Badalamenti" - titled in homage to Twin Peaks' scoring composer, Angelo Badalamenti - has been premiered at Brooklyn Vegan. WEISS states with the new single, "'Badalamenti' was directly inspired from Twin Peaks Season Three. Lynch's work deals with juxtaposed environments that often intermingle in intriguing ways. I used this concept in this song. There is a lyrical melody throughout, but there also lies an underbelly of uneasiness and brutality." Stream "Badalamenti" by DAN WEISS and crew at Brooklyn Vegan RIGHT HERE. See the trailer for Starebaby HERE. Jazz label Pi Recordings will release Starebaby on LP, CD, and digital formats on April 6th; find preorders for all formats HERE and stand by for additional audio samples and more to be issued shortly.